Staying in Branson cabin during the cold months will let you feel the spirit of the holiday season as it is fully decorated inside and out from November 17 through New Year’s Eve. This is the perfect accommodation if you want to celebrate New Year’s Eve with the whole family. 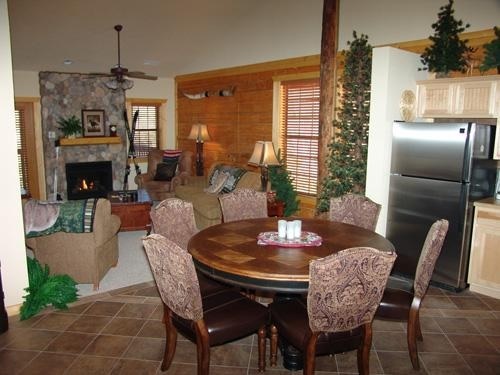 Beautifully located right in the heart of Branson, the cozy log cabin at Thousand Hills Golf Resort is beautifully built using Colorado spruce logs. Although this cabin accommodation is located in a secluded place, it is actually near the heart of the city where exciting attractions, shopping outlets, and restaurants abound. Log cabin accommodation is the most widely patronized lodging unit at Thousand Hills Golf Resort because it provides luxury and comfort for every guest. Many of the guests who have chosen log cabin to spend a wonderful escapade in Branson, described it as warm, inviting, and homey. Every log cabin accommodation at the resort features a patio where you can watch the sun rises as you sip a cup of morning coffee. It is also a perfect place to relax in mid afternoon while watching birds perching on trees and listening to their tweets. Log cabin is an ideal accommodation for families who want to celebrate New Year’s Eve as this cozy place features fully equipped kitchen with modern appliances such as fridge, microwave oven, pots and pans, dishes, and many other items. With all these great amenities, it will always convenient to cook your own food in preparation for the celebration of New Year’s Eve. As this cozy cabin at Thousand Hills is fully decorated for the holiday season, you can always feel the true significance of New Year celebration. The spacious log cabin provides every guest a gorgeous way of experiencing a luxurious and comfortable living as each bedroom features superior quality king beds with 100 percent cotton sateen, plush blankets, and comfy pillows. As guest of the resort, you can always have the chance to play with the most popular 18-hole golf course in Branson. The convenient location of log cabin accommodation near the golf course is one of the reasons why many guests fall in love with it and make them decide to return some other time. Staying at the log cabin accommodation of Thousand Hills Golf Resort in Branson gives you easy accessibility to live entertainment shows and exciting attractions in this world-famous entertainment hub. While you are having a wonderful time in the entertainment district in Branson, entertain yourself by visiting the Branson Landing so you can enjoy the spectacular fountain show of water, fire, and light that dances to the tune of the holiday season. At Branson Landing, you can find an array of retail shops that offer everything you need to help celebrate New Year right in your cabin accommodation. So, if you want to enjoy a wonderful New Year’s Eve celebration in Branson, don’t settle for just a hotel room, stay in a Branson Cabin at Thousand Hills Golf Resort.